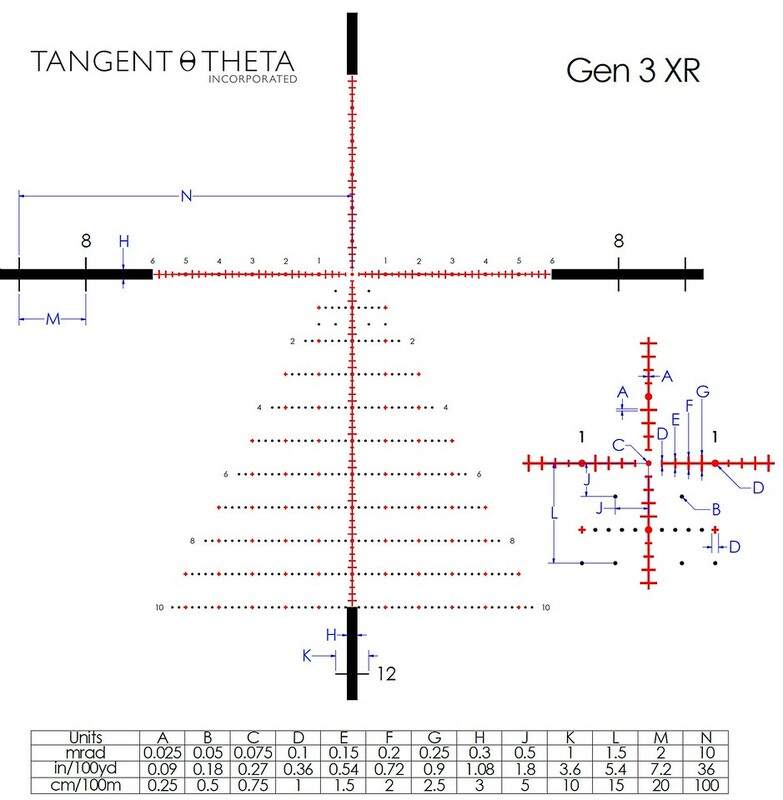 The new Tangent Theta reticle is finally out and it seems to be a really well conceived design. I saw a couple of versions of it earlier on, wasn’t allowed to talk about it. Tangent Theta got a lot of criticism in recent years for persistently staying with the reticle designs they had. I am not quite onboard with that criticism since I am pretty happy with their original reticles, but the new Gen3 XR is, undoubtedly, a more modern design. It seems to offer meaningfully more additional features, without being overly busy, so I expect it to do well. All of this, of course, is pending actual test with the reticle in the scope. So far, I’ve only seen the drawings. Once you step away from the small floating dot in the center, you get 0.2 mrad hashes that are all of different length, so you always know where you are. At every 1 mrad you have another dot, which will work well for those of us coming from Mil-Dot, Gem 2 MD and Gen2 XR. Also, note the 0.5 mrad dots below center and below 1 mrad line. That is where they are most useful. I applaud Tangent Theta for resisting the urge to plaster extra dots everywhere. All in all, I like what I see. Fantastic news, reminds me of the Minox MR4 reticle which has been one of my favorites. The Gen II XR was a great reticle but current trends have moved to the .2 mil style reticle vs. the older .5 mil style so this will keep TT up to date. My biggest question will be how it is used in the TT315M scope, the Gen II XR for some was too “light” at low mag, I wonder if TT will figure out how to make the Gen III XR more usable at low mag on the TT315M.